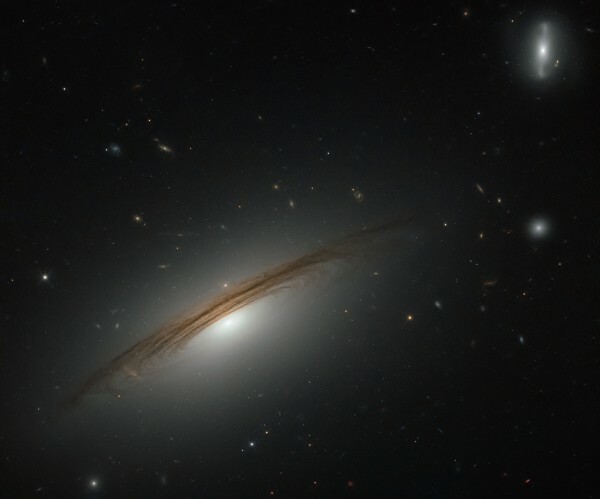 The Hubble telescope has taken an amazing picture of a hybrid galaxy, which is part spiral, like our own, and part lenticular, so lacks many new stars. The galaxy’s tremendous size also makes it stand out, with a mass four times that of our own Milky Way. It’s called UGC 12591 and lies 400 million light-years away in the Pisces-Perseus Supercluster, which is a chain of galaxy clusters hundreds of light-years long. It also spins much faster than the Milky Way – a neck-breaking 1.8 million km/h compared with our own leisurely 828,000 km/h. Scientists think its massive size could be because it either collided with another galaxy or just keeps growing, but more pictures from Hubble should help them work it out. The telescope was launched into space in 1990 and has been taking fantastic pictures unobstructed by the Earth’s light pollution, atmosphere or weather ever since.